Summer has been a relaxing and enjoyable time for me this year. I feel like there is a lack of time, but yet somehow, it feels like we are doing a lot. One thing that has been limited, but very enjoyable when I have the time is reading. 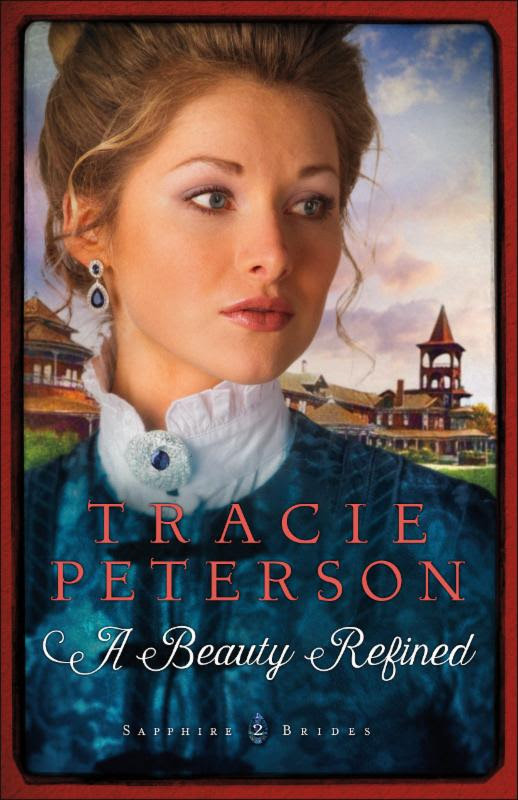 Most recently, I finished reading A Beauty Refined by Tracie Peterson. I didn't realize it (even though it is clearly noted on the cover), but this is the second book in the Sapphire Brides series. I must admit, I have never read anything by Tracie Peterson before, so I was not familiar with her work, but learned on her website that she has over 100 titles to her credit. I enjoyed reading A Beauty Refined. The historical setting of Montana in the early 1900s was the backdrop for this tale of discovering the truth and the faith needed to face it. The author did a nice job of developing the landscape for the story, including the hotel that once was and was once again. I enjoyed reading about Phoebe's clothes, many of which were the latest fashion. Despite the fact that the thought of wearing the accoutrements associated with the fashion of that day do not appeal to me, there is something so fun about the thought that there were clothes for each type of day and even for the different 'occasions' of the day. How often do you get to dress for dinner? I must admit that I had to make a small effort to overcome the coincidence of Phoebe and her father arriving in Helena at the same hotel where her mother now worked. I recognize that without that coincidence, there would have been no story, but in the early 1900s it seemed a little bit of stretched opportunity for the German Count and his daughter. As the story unfolded and Phoebe began to learn that what she had always held as true, was not actually her reality, I really felt for her. The reader journeyed with her as she went through the stages of denial, recognition of the signs, many that she had dismissed, that supported the truth, and the recognition of the truth for what it was It takes exploration of her faith to allow her to come to terms with this new reality and in that journey, she finds that Ian is the one she can turn to and becomes a more important part of her life. If you enjoy historical fiction and a touch of romance, A Beauty Refined is a book that you should consider reading. I am curious to check out some of the other historical fiction stories written by Tracie Petterson. Tracie Peterson is the award-winning author of over eighty novels, both historical and contemporary. Her avid research resonates in her stories, as seen in her bestselling Heirs of Montana, and Alaskan Quest series. Tracie and her family make their home in Montana. Find more information about her and her other books on her website. See more reviews and learn more about the book on the Blog Tour Landing Page. This book really does sound incredible! I really like the story about this women going to Montana! I want to read this book! This looks like a good book that I want to read. I really like the story and think it is intriguing and want to know more about this women!